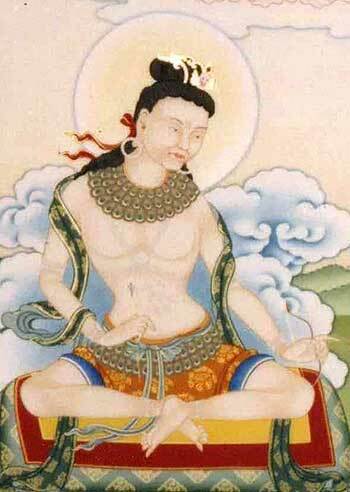 Savaripa was an Indian Mahasiddha and a major figure in the early lineage of the Mahamudra transmission. He was a hunter who was dissuaded from this way of life by Avalokiteshvara. The bodhisattva took pity on Savaripa and in order to release him from the karmic repercussions of his killing, appeared as another hunter and challenged him to a competition. When the bodhisattva felled a hundred deer with a single arrow, Savaripa could not compete. Nor could he, using all his strength, carry home one of the fallen deers. His pride in tatters and deeply embarrassed, Savaripa was then shown a premonition in which he and his wife were burning in the eight great hells, the karmic result of all the lives he had taken. Terrified, Savaripa abandoned hunting altogether and, guided by Avalokiteshvara, began to meditate on loving kindness and compassion. He later met the Mahasiddha Saraha and the incomparable Nagarjuna, from whom he received Mahamudra instructions. He practiced these for twelve years and attained complete realisation of Mahamudra. Savaripa then passed these instructions on to his disciple Maitripa, who passed them on to Marpa. He was also an important early lineage master in the transmission of the practices of the Six-armed Mahakala which were then passed from Maitripa to Khedrub Khyungpo Naljor, the founder of the Shangpa Kagyu tradition.